Description: Elegant charm blends with rustic beauty. This classic pendant is inspired by vintage peach baskets traditionally bound with wooden staves and used for gathering peaches, apples and other fruits. Not just a popular fruit, the peach symbolizes immortality and long life. The solid steel frame and hardware are featured in a Weathered Wicker/Textured Black finish. The pendant illuminates with 3 integral 5-watt LEDs. 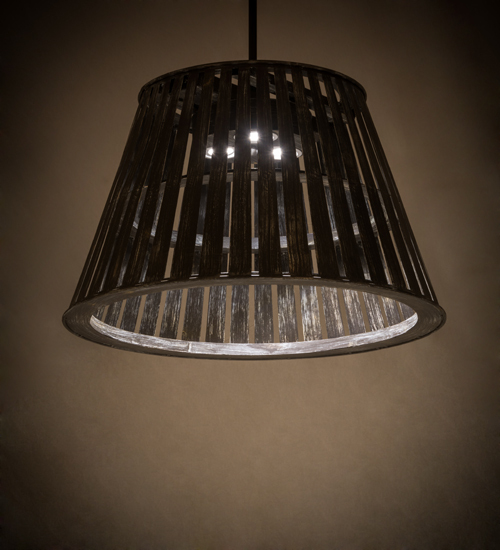 Custom crafted by highly skilled artisans in our manufacturing facility upstate New York, this fixture is UL and cUL listed for damp and dry locations. Custom sizes, designs and finishes are available, as well as dimmable lamping options.